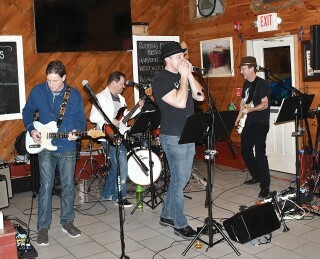 In this month’s Music Entertainment Series, we introduce Spyglass, a five-member band based out of Scarborough who performed for the first time in Windham on Friday, February 2 at 6 p.m. at Gilberts Chowder House, 61 Tandberg Trail. The first hour was dedicated to the sounds of the well-known musician, Tom Petty, who passed away four months ago at the age of 66. “We wanted to honor Petty whose music influenced all the members in the band,” stated Chris Lawrence, singer and guitarist of Spyglass, whose vocal expression eerily sounds much like that of the late musician. Spyglass, whose mission is “to entertain, tickle, and fascinate an audience; and ultimately, ourselves,” has been performing for about eight years. The core members include: Lawrence, vocals and guitar; Joe Robinson, vocals; John Buckley, drums; Brian Patrick, guitar and vocals and Tom Ryan, bass guitar and vocals. Much like most artist and musicians, their days are filled playing other roles that include that of a nurse, teacher, executive sales manager, franchise owner and recording engineer. But that doesn’t stop this five-piece band from performing year-round in the Greater Portland Area at such places like Brian Boru’s, Amigos, Oasis and Ri Ra. You will also find Spyglass performing at private parties and weddings from time to time. Whatever the case may be, the five musicians have never let go of their passion to perform music for people to enjoy, whether that is by dancing, or by “watching” them. In their effort of “running down a dream,” they have already scored another gig in Windham at Gilberts Chowder House on May 5, 2018 for the Cinco de Mayo celebrations. If you missed them the first time, you’ll have another chance to check Spyglass out in three months.